If you’re going to pay ransom money to enjoy a four-star luxury resort, you’d better be sure your kidnappers will put you up in high style. Average rating 8.7 from 2,956 reviews. With that in mind, don’t hesitate to surrender to Outrigger and leave all future negotiations on your release in the hands of your credit card company. Formerly the Phi Phi Island Village resort, the rooms here are exquisite, and the staff and facilities first class. It’s an idyllic, romantic spot popular with honeymooners, particularly Australians. 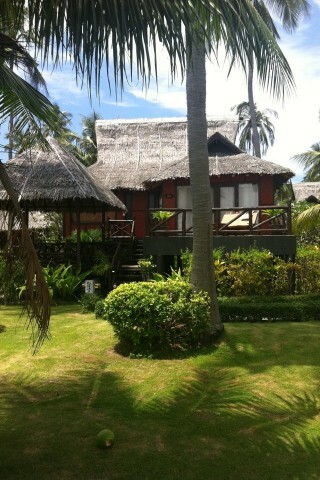 Even the standard rooms (that is to say, Superior Bungalows) are excellent. The more expensive rooms have separate living room salas, and the pieces des resistances are the pool villas, offering privacy, luxury and a private splash pool high up in the hills. A full range of services are, of course, available -- a spa, water sports, fitness and yoga centre, tennis courts, golf-cart chauffeurs, four restaurants, four bars and a huge, free-form infinity pool with a swim-up bar and jacuzzi. They’ve also added a kids’ pool with a waterslide. Ah, if only we could land our private jet here. Be aware that this place is often full, even during low season, so be sure to book in advance. A big beachside wedding was underway during our most recent visit. You pay a substantial premium here to be beachfront and we’d wager it’s not worth the hike in price. Check online rates, where you’ll often find better deals. Prices listed below include breakfast. Check rates at Outrigger Phi Phi Island Resort and Spa on Booking.com.